First Impression: Very nice pens! The X450 Wald with gold-plate trim is a heavy pen but not uncomfortable. 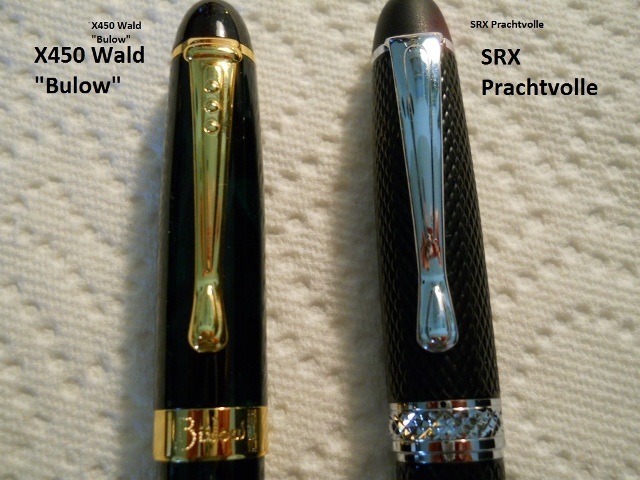 The SRX Prachtvolle is lighter with a textured finish and silver-plate trim.Both are Chinese-made pens. Finish: The X450 Wald has a greenish color to its black finish that you really cannot see unless the light hits it. Otherwise, it looks like an elegant black with gold trim. A really nice classy looking pen. Nib: Both Smooth. The X450 has a medium nib but writes like my Van Gogh midi Broad nib, only my Visconti skips occasionally. It lays down a nice, juicy, luscious line of ink! The SRX is a Medium nib, but more of a German-fine nib. It is a little more narrow in line than the X450 Wald. Not as juicy a line, but nice. Converter: The X450 comes with a very nice, but push-in converter. The SRX, which costs more, comes with a cheaper-looking push-in converter that I think MAY be a problem. We will see! Value? Wonderful pens! If you are looking for an elegant looking pen that is a smooth writer, get these now! The X450 was 14.99 and the SRX 19.99 from xfountainpens.com. You would think the X450 would cost more. Comment: I had previously purchased an X750 and it was well made. However the feeder was misaligned to the nib and it is scratchy. Too bad because it looks like a $500 pen. But at $14.99, why send it back? Edited by empyrean, 03 April 2011 - 03:48. Never heard of these pens before, they could be Indian made or are they European? Thanks for the review, always interested in seeing something new. JELL-O, IT'S WHATS FOR DINNER! Thanks! They are Chinese-made pens. 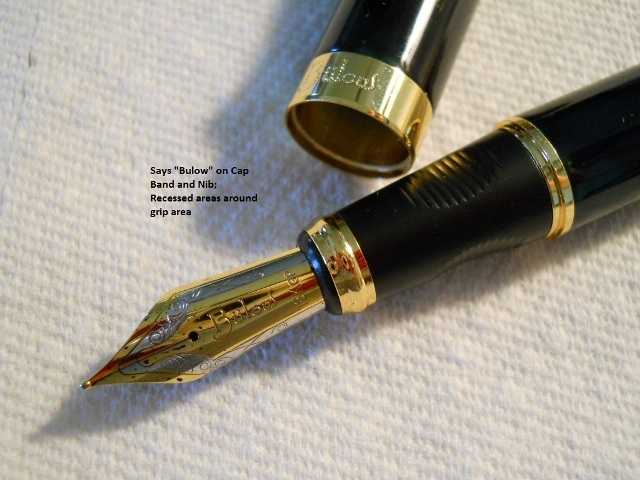 Can't get over the quality of the nib on the X450 Wald (Bulow)-goldplate. My other Bulow was a really bad nib, but this one is nice! I have the SRX Straffen and your review of the writing characteristics was spot on. Mine writes as exactly as you've described. I think Chinese pens' biggest pitfall is the QC. The material and workmanship is decent but it's a real gamble whether you get a good pen or bad. I guess that's the trade-off for the bargain price. It's either you get a deal of the year or "you can what you pay for." Edited by RNHC, 03 April 2011 - 16:35. The X450 is a Jinhao. It seems lots of people are selling it (like Chesterfield pens I believe). The other pen may very well be a Jinhao or one of the other brands that seem to come from the same place (Baoer, Bookworm, and I think there are a couple others). Ahh, I've had limited experience with Jinhao and Baoer. Pretty decent, the pens I had anyway. Really nice flow, smooth nibs. Thanks for the info. Nice looking pens. Are they lacquered metal or plastic construction? The photos don't give an indication of their heft. Thanks for the review! The X450 is metal but not seriously hefty. The X750 is a beast of a metal body pen, if that's what you're looking for. Thanks everyone! The X450 Bulow is a Jinhao; I actually saw a small "JH" somewhere on this pen! But cannot find it again (did I dream it? )It is plastic lacquer whereas the SRX is metal. Both have a good feel and weight; nice balance. RNHC--you are so right about the QC of these pens. When you get a good one, its great; a bad one, is like my first purchase of a Bulow, horrible nib. I bought these two pens together and both are great! 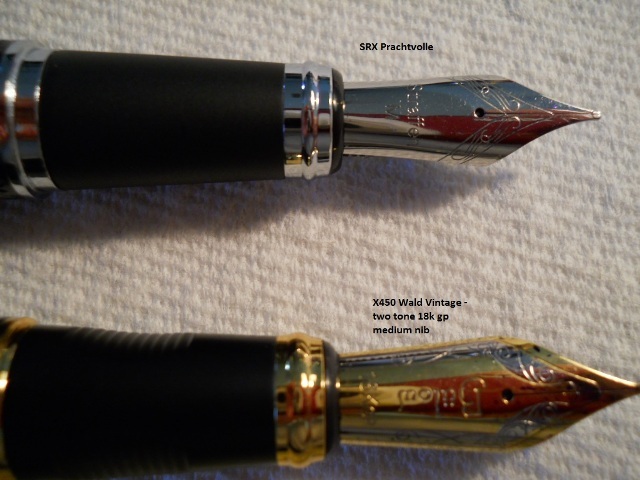 Funny though how the X450 Medium writes like my Visconti Van Gogh midi Broad. The SRX Medium is more like my Visconti Van Gogh midi Medium. Funny thing is you don't necessarily get better QC with brand name companies either. 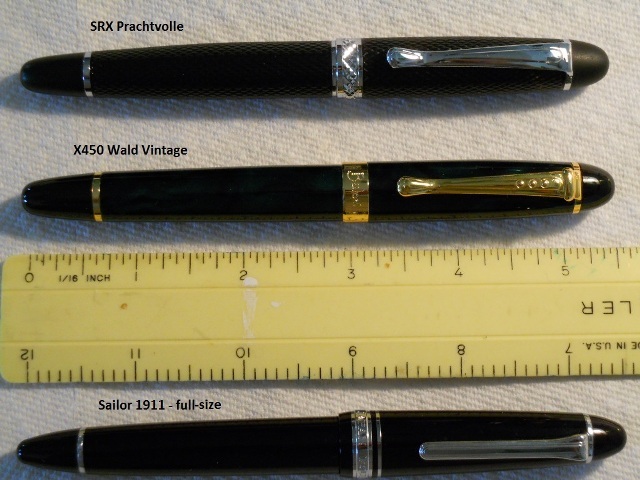 You should read about QC issues with Lamy, Waterman and Pelikan pens. At least Chinese pen companies are honest enough to acknowledge their QC issues by pricing their products so low. man, aint that the truth! I have been reading about "baby bottom" and other 'shouldn't happen on this kind of pen' stories. It doesn't sting so much when the pen is less than 10 bucks! Hey, nice review! I'm new to fountain pens (and have a budget) and I'm looking for a nice, everyday pen. However, I have smaller handwriting and so I'm looking for more of a fine nib. Where can I go to get a fine nib for these pens? This is a post from April and the Original Poster (OP) may not see your question. Fortunately I have my recently purchased X450 sitting right here. They're still nice pens, I bought 5 and have tried 4 and gotten the same results from all 4. There are no interchangable nibs on these pens and they're only marketed with medium nibs. The ink you use affects line width but then you may not get to use an ink you'd like. There are other chinese pens made with fine nibs. I've got a bunch of Hero 616 jumbos that are nice but beware of nock-offs (yes there are nock-offs of $5.00 pens). Two places I've had luck shopping are isellpens.com and xfountainpens.com. I purchased a X450 because I was new to ebay, re-new to pen collecting, and was looking for something different. Did I mention I was cheap....ok, I was cheap and figured if I got hosed for $10, I could afford it. I was way off! This pen is cool. I response to my hobby people ususlly state "What a strange hobby", to that I now have to add, the Jinhao X450, an inexpensive Chinese pen, is my favorite! Ok, a redneck from West Texas should not like anything not made in america (looking at Bexley's). This pen is great, so far the best value I have found! 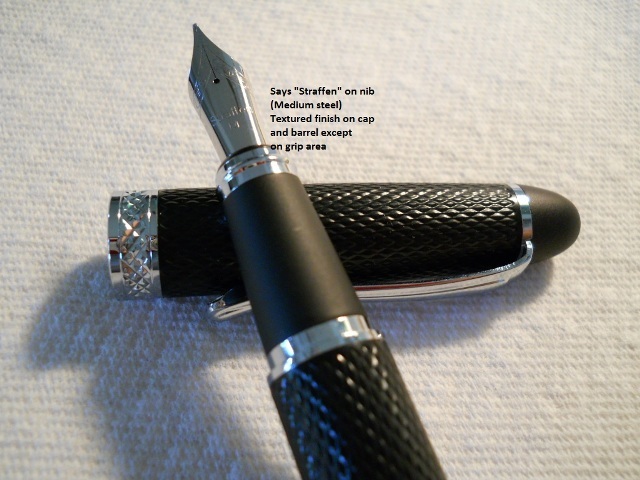 The pen is available from xfountainpens (not connected, but a fan of Knox nibs) with any of the Knox nibs from XF to OOB for an additional $6.99. Also the X450 is available in other colors/finishes. Check it out. The nibs and feeds are friction fit into the section, just grab them both and pull straight out. I bought a Jinhao x450 from x fountain pens.It arrived promptly.I ordered the fine German nib with it.I noticed on the barrel it is engraved BULOW.This pen has a Knox fine German nib.I just filled it,with no cleaning.IT writes wetly and so buttery smooth its better than my Falcon or Platinum maki e.I cant believe it.seriously it's unreal.$14.99 as opposed to $160.The pen is obviously lacquered metal of some sort because its heavy and the grip has the same triangular grip as Lamy.Honestly it;s so smooth i;m blown away. I have been pleasantly surprised with my less-expensive pen purchases. Levengers have German nibs and write beautifully. The Knox nibs are great in my opinion. The only thing I have learned is that less expensive pens cannot usually have their nibs "tweaked" or tampered with (successfully) in order to increase ink flow. I recently bought a "bookworm" Chinese pen; looks like a Delta and writes very nice~!